steve s. had the most liked content! The sleeper in My H63 is 24" wide. There were non sleeper H models, I have seen them in H-69 and H-81. There probably were others as well. You might try contacting John Chalmers in Cashtown PA. I purchased tie rod rebuild kits from him a couple years ago. I think he has been downsizing, but he may be able to help. His number is 717-334-8709. Good luck. The Australian Mack MIR did use the Brockway Huskiteer cab. If you check your Double Clutch magazine, you will see mention of it in a recent article on Mack Cabovers Downunder, by Gary Richards. There will be a follow up story coming up soon on the MIR. 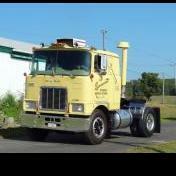 This is the only known use of a Brockway cab on a Mack chassis. Sunday September 2rd is the date for the 28th annual Endless Mountains Antique Truck Show and Flea Market sponsored by the Northeastern PA Chapter of the Antique Truck Club of America. The Harford Fairgrounds is the location, about halfway between Scranton PA and Binghamton NY. Easy to get to: exit 217 off I-81, follow the signs. 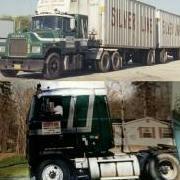 All old trucks are welcome, any size, any condition. No registration fee, only $2.00 to enter as a spectator. Kids under 12 enter free. Breakfast , lunch, and ice cream available . Affordable fun for the whole family! Several awards offered, including Best Mack, and Working Class Truck. We always have a lot of Macks on display ! Parts are out there, but you will have to figure out what will work on your truck. You are not likely to find anything being sold as a part "for H model Mack" .The H model cab is based on the L model sleeper cab. Some L model parts will fit , including the doors. The drivetrain shares many of its parts with B and other models. The engine and transmission are basically the same as a B model for instance, but the mounts, fan, radiator, shifters and other pieces are different for the H. If your cab and frame are good and you want to put the truck back together, your best bet might be to find another H model for parts. Most H model parts are interchangeable between the 63 and 67. Good luck, and keep us posted. I agree you have a very cool truck there. Not a common model at all. Before trying the drill and tap method, I would attempt to rotate the shaft back out of the notch. Pulling it straight out won't work because the ball is probably entirely in the notch. But the rotating shaft might just allow the ball to be pushed back into its hole. Worth a try anyway. Drilling and tapping is a good last resort for sure. That top cover is not that rare of a part that you can't find another one. You might not find an aluminum cover, but there are still triplexes around. Good luck. Welcome, Jim. I spent last winter doing a tandem to single axle conversion of my B61. The job itself is pretty straight forward . Assuming that the tandem you are talking about is a camelback suspension with top load rears, You probably won't be able to reuse them as a single axle. You will need to find a single axle rear, springs and spring hangers. Then you just basically drill for the hangers, mount the rear, make a new driveshaft, and re plumb the brakes. There are some options to consider, like what gear ratio would suit you best, or do you want to install a modern rear and air ride. Also keep in mind that your DOT may complicate matters if you try to reduce the truck's GVW. You don't have to change the GVW, and maybe it doesn't matter if you tag the truck as an antique. Just another consideration. There are plenty of single axle trucks around. Very nice truck. Glad to know it has a good home. There was an article in Double Clutch magazine about the Kreitz company a few years ago. I believe there may have been pictures of your truck in that story. Sunday September 3rd is the date for the 27th annual Endless Mountains Antique Truck Show and Flea Market sponsored by the Northeastern PA Chapter of the Antique Truck Club of America. The Harford Fairgrounds is the location, about halfway between Scranton Pa and Binghamton NY. Easy to get to: exit 217 off I-81, follow the signs. All old trucks are welcome, any size, any condition. No registration fee, only $2.00 to enter as a spectator. Kids under 12 enter free. Breakfast , lunch, and ice cream available . Affordable fun for the whole family! We always have a lot of Macks! The picture of the "transfer case" does not help me to identify it. A transfer case is used with four wheel drive, which this truck is not. I suspect the transfer case may have been used as a multi speed PTO. Was either of these transmissions used to power the winch? Was there more than one winch, or more than one PTO? Interesting. How is the second transmission driven by the main transmission? A shaft? The " second strange transmission behind the cab" sounds interesting. Some pictures would be very helpful to know what it might be. It is probably not Mack built, but may be worth saving. At least see if there is an ID tag on it. Please let us know how you make out with the cab pivot bushings. I could use a set myself. As a last resort, I thought I could make some if I ever get around to it. We use different types of urethane to make molds at work. The rear cab insulators re available from PAI, they are the same ones used on the transmission. Good luck with your project.